April is Distracted Driving Awareness Month. We all try to multi-task, especially while driving…one of the worst places to do it! On your way home from work, rushing to think of dinner plans, you decide ordering take-out is easiest. While driving you are searching your phone for the number or asking Siri to find it for you, not fully paying attention to the road. A car stops short in front of you and you end up rear-ending them. If you are lucky everyone is ok. However, this is still an at fault accident that will give you a surcharge on your car insurance, just because you were trying to multi-task. Don’t. 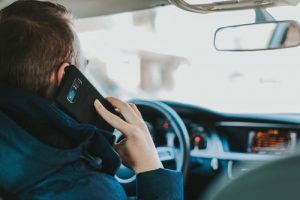 One call/text while driving could ruin everything . The statistics are there – you are 4x more likely to get in a car crash while using a cell phone or hand held device. The truth is using your cell phone in any form, is making you a distracted driver. Please don’t make a statistic out of yourself and take the focused driver challenge. There are many ways we can be distracted while driving, but using a cell phone is the number one distraction. So if you try to limit your phone use to while you are stopped or when you get to your destination, you will be a lot safer and so will the other people on the road.